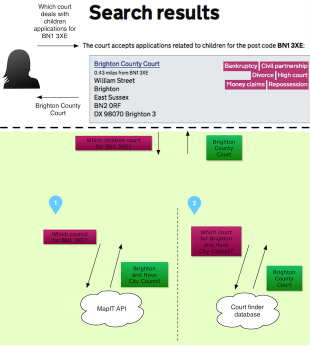 We updated court finder this week to allow parents to find the right court if they're applying for child custody or contact with their children. This is ahead of changes to the courts system in April, when users will have to go to a 'single family court' based in the area of their local authority. You can now enter your postcode and select 'children' from the areas of law in the drop-down menu to find the court that can deal with your case. For example, if you live in BN1 3XE you'd need to send your application to this court. This ensures that you contact the correct court and that there are no delays in dealing with your request. Developer Jairo Diaz reused an application programming interface (API) offered by non-profit organisation mySociety, which cleverly links up postcodes and local authorities. He then linked these data with info on the courts (with the help of HMCTS colleagues Adam Lennon and Paul Stewart). 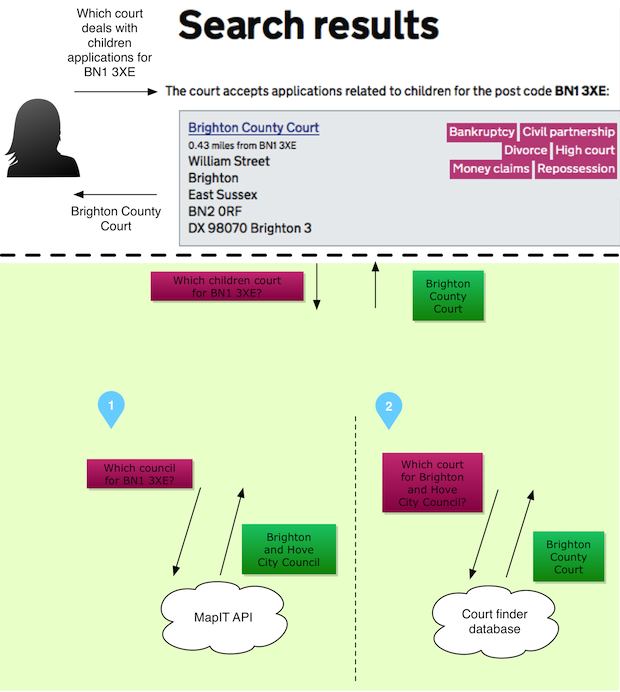 This complexity is hidden from the end user and what they see is just the end result - the court information. Hrishi has also made the back office interface easier to use, so court staff can update content with no errors. We welcomed a new addition to our team - Danny who joined as a developer this Monday. His very first contribution was to add a display of the court finder version at the bottom of each page: currently version 2.5.3. This shows how we're constantly updating and improving the service, with regular releases. Sjors and Graham are designing the overall user experience for searching and updating family courts that deal with adoption and divorce. Expect to see this functionality soon.